Thomas Fahy Naughton of the Anglers hotel, Oughterard would appear to be one and the same as “Thomas Naughton” who was born to William Naughton and Sally Murphy in the parish of Annaghadown, Co. Galway in December 1837 and baptised in the church of St. Brendan on December 12thof that year. His God-parents are recorded as John Naughton and Judy Hession. The Northern Standard newspaper of the 11th June 1864 carried a public notice giving the names of persons who wished to be considered for a Spirit Licence. The name Thos. F. Naughton, Diamond, Monaghan was amongst them. Birth of a daughter on 28thFebruary, 1866 in the Diamond, Monaghan who was named – Sarah Elleanor. Her father is recorded as “Thomas F. Naughton” and described as a Spirit Dealer. Apparently he was managing a pub which was situated in the Diamond, Monaghan and owned by his wife’s brother – John Blacker. It would appear that Thomas Naughton became involved in National politics and adopted the name “Thomas Fahy Naughton”. A report in the Freeman’s Journal newspaper of the 8thOctober 1870 records two men, one – William McGuiff of the parish of Toormore, Co. Mayo and the other – Thomas F. Naughton of Diamond, Monaghan being barred from owning or holding a firearms licence by order of the Lord Lieutenant. On the 8thOctober 1872 the Magistrates in Monaghan refused to sign the certificate which would enable John Blacker to renew the licence on his public house, on the grounds that he did not reside there and in any event, he was selling the public house to man from Enniskillen. This may have been the reason Thomas F. Naughton decided to travel to the U.S.A. No details of his entry to or departure from the U.S.A. have been found. I have been unable to chart his journey to Oughterard, or his reason for settling there. The United Irishman paper of January 3rd1891 reported a meeting of the Parnell Leadership Committee which was held in the National Club, Dublin on the 3rdof December 1890. A request was made by the Committee that the persons listed should sign a form, as members. Of the hundreds of names listed from all over Ireland, there is a Thomas Fahy Naughton of Oughterard which indicates that he had settled in Oughterard by 1890. 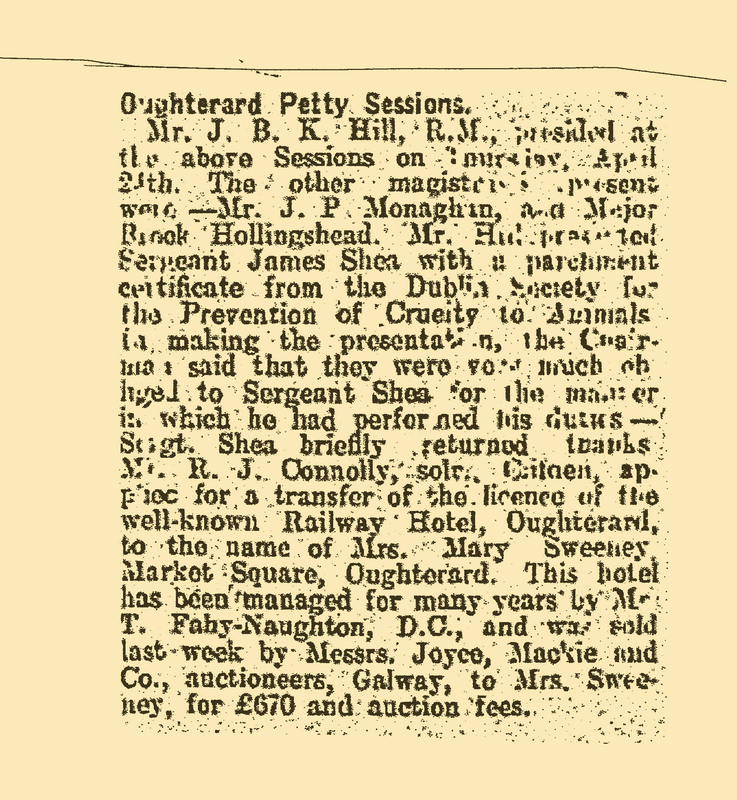 The Freeman’s Journal of 20thAugust 1900 reported the holding of a meeting of the United Irish League in Oughterard. The attendance included John Dillon M.P. and William O’Malley M.P. for Connemara. William O’Malley M.P. proposed that Thomas Fahy Naughton chair the meeting. This was seconded by John H. Joyce, Oughterard. At the end of the meeting Mr. Fahy Naughton was thanked by Mr. O’Malley M.P. for chairing the meeting and for his contribution to the National Cause in North Dublin and Connemara. This was seconded by Mr.John H. Joyce who stated that he was making a contribution of one sovereign to the election fund. In April 1913 following the death of his wife Elizabeth on 27thMarch 1913, he decided to sell the Railway Hotel. Their only child, Sarah Eleanor, had died on November 6th1903. 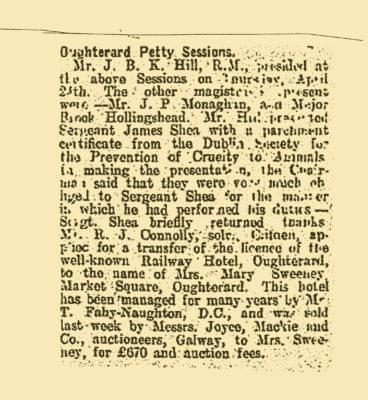 On the 18thApril 1913 at the courthouse, Oughterard it was sold by public auction to Mary Gertrude Sweeney of Oughterard for £670.0.0 + auctioneers fees. Thomas Fahy Naughton died in Oughterard on 13thDecember 1914. His death was notified by Michael Walsh, The Bridge, Oughterard. Probate of his estate was granted at Tuam on February 27th1915 to Michael Walsh, Carpenter and Patrick Naughton, Shopkeeper of Oughterard. Effects: £761-7-6.